Here is a submission from DigElog ROCORI’s own Dustin Williams. 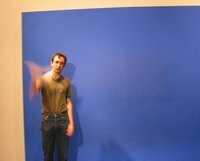 This was shot as part of his coursework at St. Cloud State University. 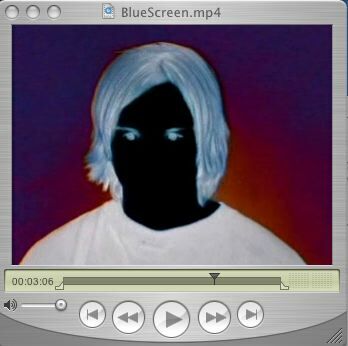 The film follows a young man who is searching for purpose in his life. In doing so, he visits special events that have taken place in his past- both figuratively and literally. By facing some of the demons that have haunted him, he is able to progress though the journey of life. Here's a series of commercials made by our own ROCORI Media Students on the topic of teen drivers. They put this together as a part of a class project and a contest put on by the Minnesota Department of Public Safety. The top producer will win $1000 so we wish these contestants the very best of luck. This is a shortened version of a mini documentary two young people in the "Land Of Rocori" did on the life of Herb Brooks. Included in this very well done piece are personal inteviews with John Harrington and Craig Dahl. If you're a hockey fan or if you can remember the 1980 Gold Medal Hockey Team USA... you'll want to watch this video. It's a great story about a man who knew how to dream and then inspire new ideas. These two kids, their parents and their teachers put an enormous amount of work into this story. It's amazing to see what can be done by our young people in this age of digital technology. This story is sponsored by Assumption Campus in Cold Spring. Please join them in celebrating the special blessing service and "Open House" featuring the recent new addition made to Assumption Court. The event begins at 2:00 pm on May 20th and will include guided tours of Assumption Court until 4:00 pm that afternoon. Have you ever thought about the actual location on the globe that the shirt you are wearing was manufactured at? Here's a great ROCORI High School Media Class project that does just that. You'll get a chuckle as school teachers, students and janitors all get into the act trying to tie their shirt to some place on the globe. This story is sponsored by the Great Blue Heron restaurant in Cold Spring. From personal dining to weddings and banquets. The Great Blue Heron specializes in "great food", "superb service", and a relaxing environment. "Better Than Good... The GREAT BLUE HERON"
This is a ROCORI High School Media project that shows the new house recently placed up for sale by Mr. Christie's Residential Carpentry class. Each year Mr. Christie's class has a major building project that provides hands-on experience for the students. This video shows how the home was built and includes a touch of High School humor that you're sure to get a chuckle out of. 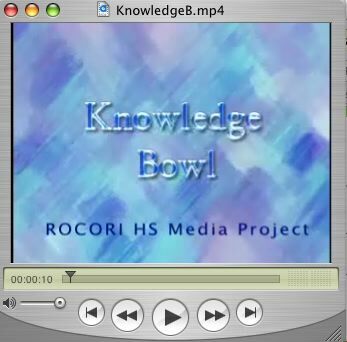 Here's another ROCORI High School media project where this time we pit the Students against the Teachers when it comes to answering questions as a part of the Knowledge Bowl program. Who do you think won this competition? Check out this five minute highlight video to get a feel for the pressure of being behind the wheel of the Knowledge Bowl. Check out this video made just before the event created by a ROCORI High School Media Student. They did a terrific job. 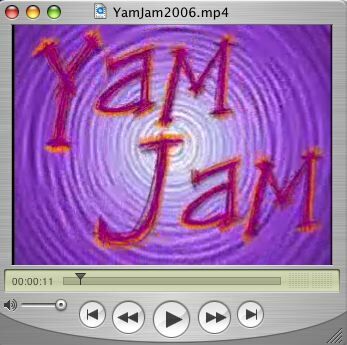 Also view some photos from YAM JAM 2005. 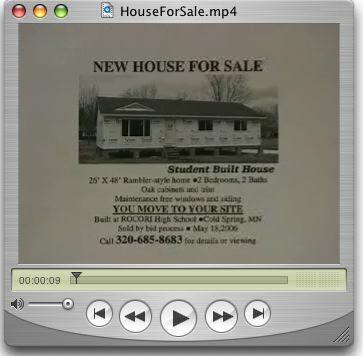 Here's another great media project by one of our ROCORI High School students. This story introduces us to ROCORI High School SNOW-DAYS week. One of the fun events of SNOW-DAYS is the Medallion Hunt. A special medallion is hidden somewhere in the school and a special poem is written to help lead the student detectives to the medallions unknown location.